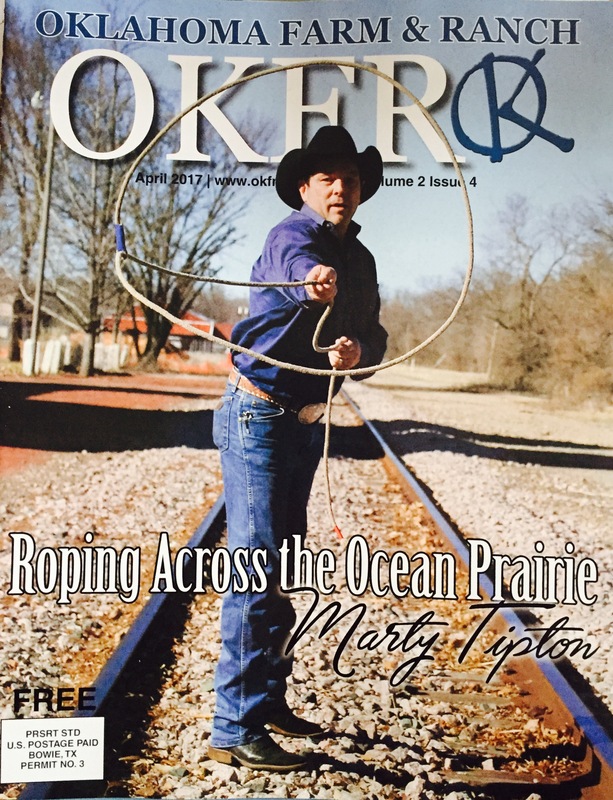 The saying goes, “Jack of all trades, a master of none,” but trick roping humorist Marty Tipton is a master of all trades. With relative ties to Will Rogers by his grandmother Delia McSpadden, Tipton has in common with Rogers, his handiness with a rope, spinning a rope from three feet to 100 feet while entertaining audiences with his humor. Tipton, originally from Enid, Okla., said he was born with a rope in his hand just like his forefathers. His great-grandfather worked on the 101 Ranch in Pawnee, Okla., originally, and worked in leather shops. Tipton’s grandfather and father also worked in the leather business. His father started as a leather tooler, later becoming a saddle maker. His grandfather, Orlan Tipton, was a harness maker, and Tipton remembered how his grandfather appeared older than his age because of his hard lifestyle. His grandfather was one of the original acts in the Pawnee Bill Wild West Show in Pawnee, Okla.
His grandfather lost three fingers in a baler while baling hay. Tipton’s father, Raymond Tipton, ran seven miles to save Orlan because he was bleeding to death. Tipton went on to be successful in trick roping even without three of his fingers. Tipton said he did not believe him, but his grandfather proved him wrong. His grandfather completed a trick with a rope between his toes. Orlan also raised and trained horses as well as owned a harness shop. He made harnesses for pulling ponies, carts and buggies. Raymond followed in Orlan’s footsteps, building saddles and bridles. Raymond was more of an equipment engineer, while Orlan was a manufacturer of the products. His father also collaborated with Phillips Petroleum to produce a plastic petroleum tree to hold leather. Raymond owned Salt Fork Saddle Company and moved the company to Tonkawa, Okla., a year after Tipton was born. Raymond was also a champion bronc rider and team roper. Tipton recalled traveling to rodeos with him on the weekends, where he began riding bucking ponies in the Little Britches Rodeo Association at six years old. When a rodeo accident resulted in 60 stitches across Raymond’s head, Tipton decided to not ride broncs like his father. Instead, the young cowboy went on to ride bulls. Tipton was also a team roper and had many partners in roping arena throughout the years including friends, Billy Scott and Matt Crumrine. While he was competitive in the arena, his family sold ropes, spurs and other rodeo equipment at rodeos. Even on his mother’s side of the family, Tipton has roots in the leather manufacturing industry. He opened a western store, later creating WR Leather Company. His maternal grandfather worked in the leather industry, but he was also a race horse trainer in Ponca City, Okla.
His maternal grandfather and father taught him how to network, leading him, Tipton was making his own leather products including braided five-plait roping reins and had his own product line by the time he was 13 years old. They both taught him how to build his own business. When asked if he felt obligated to follow in his family’s legacy, the entrepreneur said he saw a split in the road for his future. He was an asset in the leather industry in sales. He traveled to the International Finals Rodeo and National Finals Rodeo demonstrating leather products as well as the National Western Stock Show and Rodeo, where he also competed. “By the time I turned 14, my dad said, ‘If you’ll quit, I’ll send you to live with Donny Gay, eight-time world champion. He’ll train you how to ride bulls,’” he recalled. The young bull rider was motivated to stay out of trouble and continued to work in the leather shop and rodeo. When he turned 16, he and a few other cowboys loaded up in an old Winnebago and headed to Mesquite, Texas. He spent a month learning from Donny Gay, Neal Gay, Larry Mahan and bull fighter Kid Calloway. Tipton trained every day, learning how to ride bulls and bull fight. On his last day in Texas, a bull stepped on his femur bone and broke it. When he got back on his feet at 17, he hit the ground running, riding bulls and farming for Lucas Farms. After he graduated high school, Tipton continued to bull ride, but he also was a professional bullfighter with friend, David VanBuskirk. Together, they had an act where Tipton would dress like a woman and set a flash bomb off in his pants. VanBuskirk went on to become a fire marshal in Ponca City, and Tipton enlisted in the U.S. Army, joined the 82nd Airborne and served in Panama. He was discharged in 1993, and went on to receive a bachelor’s degree in business from the University of Oklahoma in 1996. After graduation, he landed a job in finance in Oklahoma City, later taking a job in Florida. The former accountant described his life in Florida as a Kenny Chesney song. He worked in finance for about four years before returning to the ocean prairie. He worked on a ranch building fence, working cattle and breaking horses. He also moved back to Oklahoma to care for his grandfather. Tipton said he thought it was a joke, but he joined Dave on stage. May reached down in a trunk, pulled out a trick rope and handed it to him in front of 200 people. Tipton was embarrassed, but he performed a few tricks. After his performance, the trick roper agreed to perform again. He markets himself using a nickname given to him by his maternal grandfather at the racetracks in grade school. He received the name “Oklahoma Kid” because people at the racetracks would say, “Go get that kid from Oklahoma. He will clean your horse stalls for $1. The Oklahoma Kid had a knack for talking to people while helping them at the same time. This ability opened many doors to perform. Each show is different, he added. It takes Tipton about two weeks of studying scripts, learning the type of personalities and tailoring his performance for the show. The cowboy trick roper said his goal is to relate to each person in the audience in some way whether it be 20 or 20,000 people. He will even bring along a few extra trick ropes to teach audience members a trick or two including the flat loop. Being a cowboy has given Tipton an advantage in performing on stage because it grabs the audience’s attention. He is the only cowboy roper today who will interact with audiences. While there are other talking cowboy ropers, Tipton said they are circus acts and have never worked cattle on a ranch. “I think that it’s the authenticity of myself and growing up in a place where I had to really work hard, get up and feed horses and cattle every morning that makes the difference,” he added. Because of his ability to interact with audiences and perform, he can travel across the United States showing people his Western culture through spinning his rope. He portrays Will Rogers in a few shows each year. Having relative ties to Rogers has helped him, but it has taken him many years and research to perfect his performance. When he first started honing his skill as a trick roper, Tipton studied Rogers as well as Hollywood trick roper, Montie Montana. Tipton also enjoys working with charitable organizations and fundraisers like The Children’s Hospital at the Oklahoma University Medical Center, Wings Charity and the Oklahoma City CEO Chamber of Commerce Banquet. He has also worked with Broadway Productions, where he has performed or trained other performers. When asked how many shows he performs in a year, he said asking someone how many shows they do is like asking someone their age. The trick roper said he makes 50 to 300 appearances each year, some lasting all day. He carries 20 ropes for different tricks. Some ropes are weighted, stressed and treated to perform a specific trick. When Tipton gets a new rope, he practices with it for about six months to get the feel of it. The number of tricks he performs in show depends on the show, some tricks are performed on horseback. The trick roper continues to develop his trade, and his show changes each year. His favorite tricks are the hand shaker and the Texas skip. He implements the latest technology into his performances, and he is debuting new tricks this year including spinning ropes dipped in kerosene and lit on fire. Tipton said he is grateful to have the support of his manager and wife of nearly 10 years, Jill, whom he described as his “June Carter.” Today, they reside in Shawnee, Okla., and have two daughters, Bella and Bristle. Like Tipton, both of his daughters are mastering the art of trick roping.